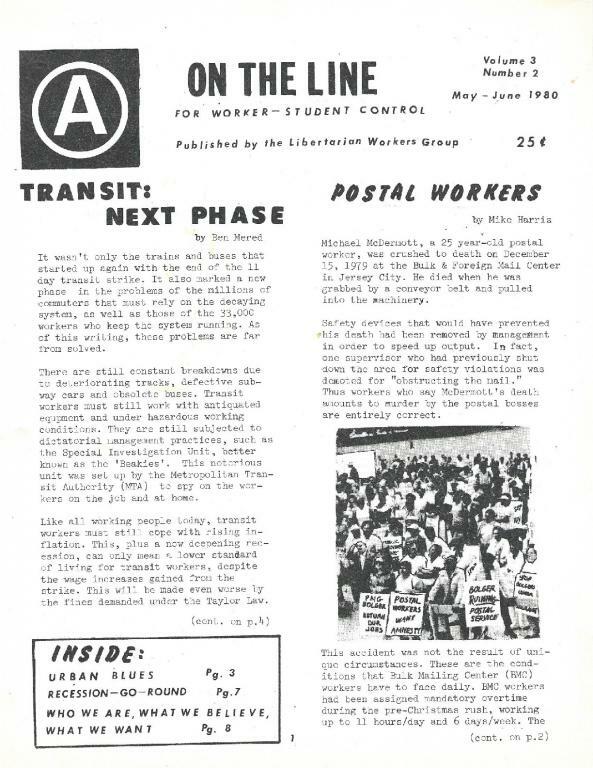 'On the Line' was a agitational newsletter put out by the New York based Libertarian Workers Group, which was affliated with the Anarchist Communist Federation of North American and one of the founders of Workers Solidarity Alliance (WSA). 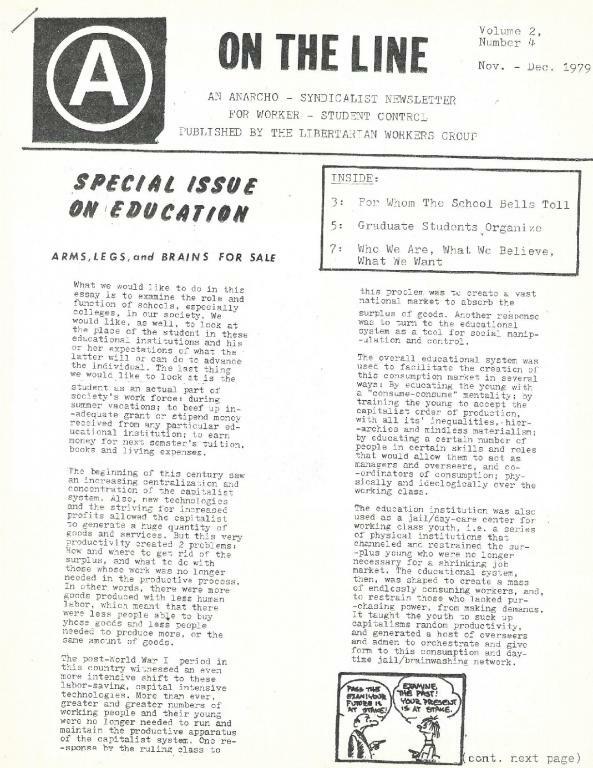 It then became an occasional newsletter of WSA in New York/New Jersey. 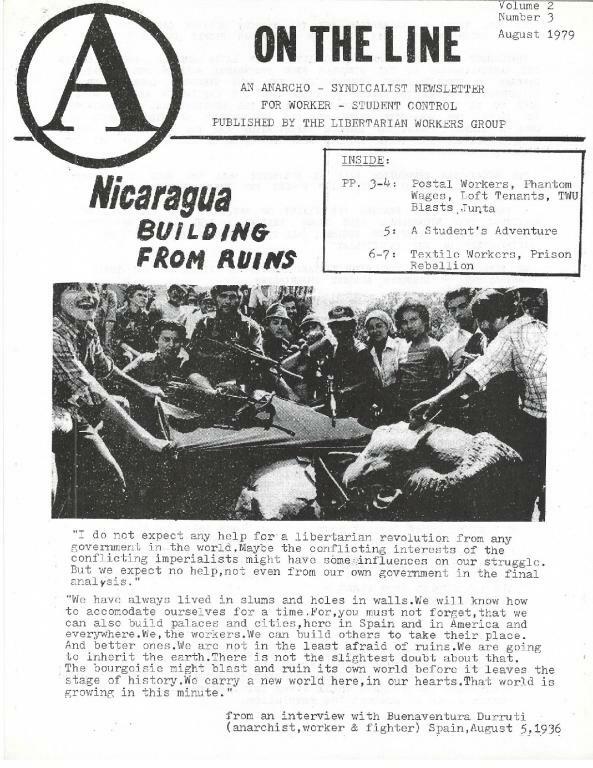 First issue of the Libertarian Workers Group's agitational newsletter. Some drivers from Lucky, one of the garment center's largest movers, were complaining recently about how the union isn't taking care of the workers in their company. At least thirty people working on the trucks aren't members of Local 102, International Ladies' Garment Workers Union (ILGWU), which has the contract. People like the union benefits but say that they should be for everyone. The manager and an organizer from that local have been implicated in an attempt to bribe an independent union organizer in New Jersey, so maybe their hands are full looking for cover. Maybe the issue of non-union workers doing union work hasn't been brought up at a Local 102 membership meeting because the members know about the riot at the contract ratification meeting of Local 98, also ILGWU, in February. "Niggers ain't gonna work for low wages these days. This ain't a plantation," said one black member after the membership turned down the contract. The contract was passed by the local executive board three days after the riot. The leadership blamed the Teamsters and radicals. The hospital workers didn't strike this time. The last strike didn't get the workers very much and didn't prevent the sub-contracting out of work by the hospital administrations, which was the real issue at stake. The union, Local 1199, didn't explain about the sub-contracting issue to the public and so put off building a much needed worker and community coalition. People were camping out in front of several union halls last month when some of the apprenticeship programs opened up. It reminded me of the Depression days. 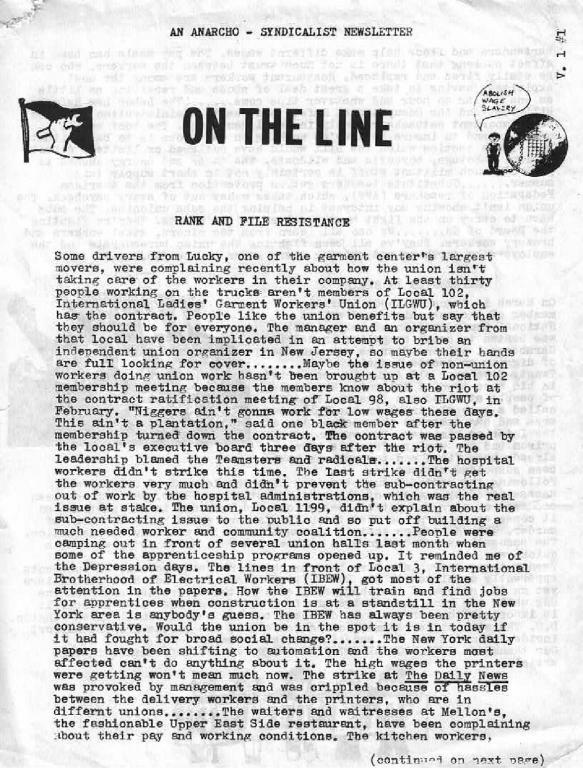 The lines in front of Local 3, International Brotherhood of Electrical Workers (IBEW), got most of the attention in the papers. How the IBEW will train and find jobs for apprentices when construction is at a standstill in the New York area is anybody's guess. The IBEW has always been pretty conservative. Would the union be in the spot it is in today if it had fought for broad social change? The New York daily papers have been shifting to automation and the workers affected can't do anything about it. The high wages the printers were getting won't mean much now. The strike at The Daily News was provoked by management and was crippled because of the hassles between the delivery drivers and the printers, who are in different unions. The waiters and waitresses at Mellon's, the fashionable Upper East Side restaurant, have been complaining about their pay and working conditions. The kitchen workers, bartenders and floor help make different wages. The pay scale has been in effect so long that there is not much trust between the workers, who can be easily fired and replaced. Restaurant workers are among the most exploited, having to take a great deal of abuse and receiving as little as one dollar an hour and whatever tips come. The Labor Law Reform Bill lost and the Occupational Safety and Health Administration received some important setbacks recently in legal decisions. The best way to organize and to insure that we're working on safe jobs is to be militant and to use tactics which the Bill would have outlawed or limited: direct action, sabotage, boycotts and wildcats. The anger and energy needed to pull off such militant stuff is certainly not in short supply this summer. Substitute teachers get no protection from the American Federation of Teachers (AFT), which takes money out of every paycheck. The union isn't showing any interest in helping the subs unionize. The subs have to carry on the fight by themselves in the courts. They're fighting the Board of Ed. We can all learn from the miners, steel workers and brewery workers. They've all been fighting the union bureaucrats and the employers by striking and showing their power on the job. On March 14, Augustin Rueda Sierra, a member of the anarchist-syndicalist National Confederation of Labor (CNT) was beaten to death by police in Madrid's Carabanchel prison after he was accused of digging an escape tunnel. Twenty-five year old Augustin was buried in his hometown of Sallents. Thousands of people attended the funeral. The CNT called a general strike in the Sallents area and has demanded the resignation of the Interior Minister. The warden of the prison and two senior officials have already been fired and ten wardens have been suspended without pay. Following the the death of Augustin, the Director General of Prisons was assassinated by members of the semi-Maoist group GRAPO. The CNT has been accused of carrying out assassinations and bombings in the past and so it comes as no surprise that the union is once again being accused of murder. The CNT denies that it has anything to do with the assassination. The accusations are designed to setback the CNT, which is growing at a quick rate. Twenty-three anarchists have been arrested in Spain recently in incidents apparantly unrelated to the Rueda Sierra case. We do not have particulars yet on the nature of the charges. Eleven of those arrested are from the CNT while the remaining twelve are from autonomous anarchist groups. It is important that protests be directed to the Spanish Consul in Washington, D.C. The special harassment of anarchists is due to the growing support inside Span for the CNT and libertarian ideas. Our thanks to News From Libertarian Spain for the information in this article. Members of the Industrial Workers of the World Industrial Union 440 won a major victory at Mid-America Machinery Co. in Virden, Illinois late in April. According to the June issue of the Industrial Worker, Administrative judge Robert E. Mullin issued a directed bargaining order in favor of IU 440. The judge, in a stringy worded decision, wrote that the owners of Mid-America carried out their operations in violation of the National Labor Relations Act. The judge noted that "Since July 27, 1977, the Union...has been the exclusive collective bargaining representative of the Respondants employees..."
Throughout the hearings the judge continually refered to the IWW's witnesses as credible, which at one point he referred to the testimony by Mid-America's owner Larry Jabusch as "manifestly incredibility." Mid-America's workers were able to prove that the company acted in violation of the National Labor Relations Act, Section 8: (a) (I) of the Act, which prohibits restraining, coercing, interrogating and spying on workers engaged in union activities; (a) (3) the company was found guilty of discriminatory laying off all its shop employees between July 26-August 1, 1977. 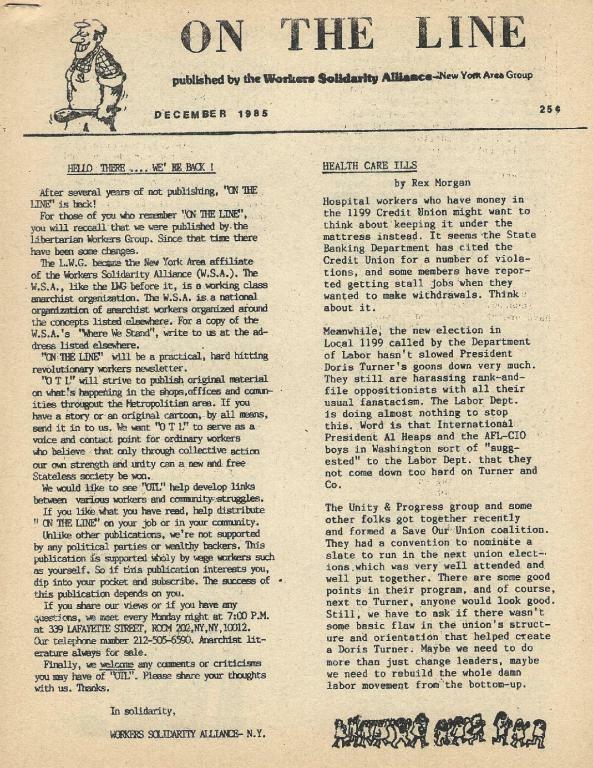 The layoff was due to the active participation of a majority of the workers in the IWW organizing drive. The second violation was the confinement of a worker in the paint shop due to his union activities. The company was also found in violation of Section 8 (a) (5) for refusing to recognize the OWW as the bargaining agent of the workers. A majority of the costs for this organizing drive is being carried by the IWW and funds are urgently needed. Please send all contributions to [address removed]. Thanks to the Industrial Worker for the info. Members of the International Longshoremen's and Warehouseman's Union (ILWU) have acted in solidarity with their Chilean fellow workers twice by refusing to load 22,000 pounds of bombs destined for Chile. On May 23, ILWU Local 10 and Ship's Clerk Local 34 received word that the S.S. Seajet was due to arrive in San Francisco on June 2 to pick up the cargo of bombs. Upon hearing the news members of the two locals announced that they would not load the bombs. The cargo was moved to the U.S. military base in Oakland, CA, where it was re-scheduled to be moved later on. The ILWU issued a statement notifying the company and the U.S. government that the cargo would not be handled now or ever. Contracts between postal workers and the U.S. Postal Service (USPS) will expire on July 20. The USPS is threatening to bring in federal troops of a new contract is not accepted by the rank and file and of there is a strike. The chief negotiator for the postal workers, La Penta, has stated that the postal workers are being "targeted" by the USPS and the Carter administration to exercise new federal wage controls. A spokesperson for the USPS refused to discuss the report that the Pentagon will intervene in the strike, but admitted that there are "contingency plans" in case of a strike. Federal troops would be of little use in the event of a strike. Sixty percent of the postal system is mechanized. In 1970, when troops intervened to break the last postal strike, only a small percentage of the system was mechanized. Socialization and collectivization of all the means of production and distribution by the working class. In other words, for a soceity run and controlled by those who produce the world's wealth. For the use of the Social and General Strike to abolish capitalism and the state. For the abolition of the wage system. For working class education in the principles and functions of anarcho-syndicalist economics, theory, mutual aid and organization. For the free development of individuals and the extension of democracy into every area of life. For class war defense work. We are members of the Libertarian Workers Group, which is affiliated with the Anarchist-Communist Federation and the International Workers Association. In order to keep up with the high costs of printing and postage we must ask a subscription price of $1.00 per year. Larger donations are always encouraged and welcome. 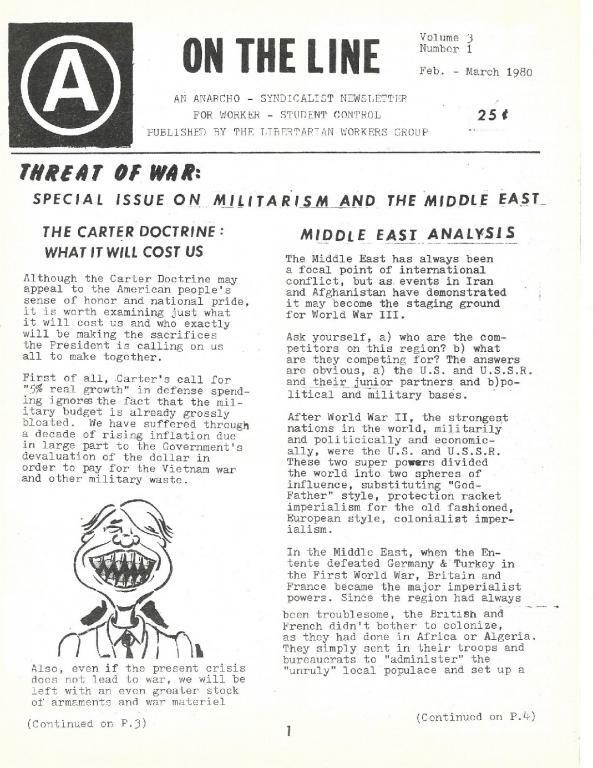 Second issue of the Libertarian Workers Group's agitational newsletter. 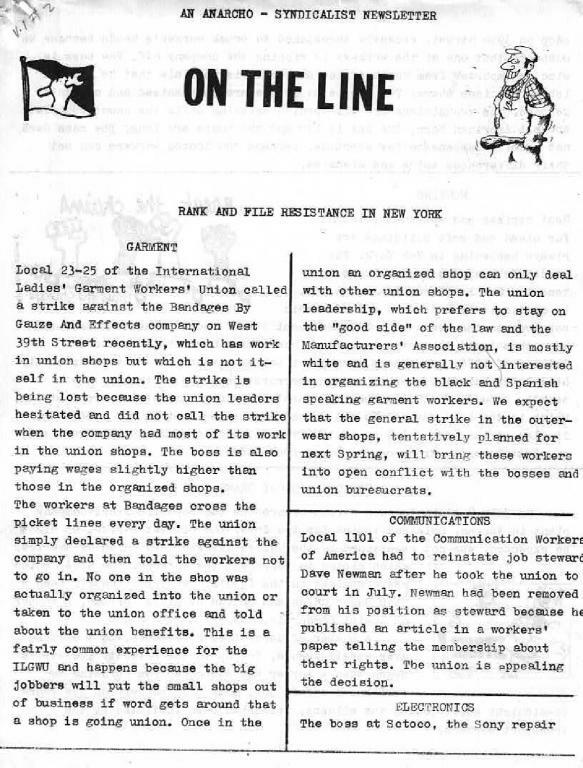 Local 23-25 of the International Ladies' Garment Workers' Union called a strike against Bandages By Gauze and Effects company on West 39th Street recently, which has work in union shops but which is not itself in the union. The strike is being lost because the union leaders hesitated and did not call the strike when the company had most of its work in the union shops. The boss is also paying wages slightly higher than those in the organized shops. The workers at Bandages cross the picket lines every day. The union simply declared a strike against the company and then told the workers not to go in. No one in the shop was actually organized into the union or taken to the union office and told about the union benefits. This is a fairly common experience for the ILGWU and happens because the big jobbers will put small shops out of business of word gets around that a shop is going union. Once in the union an organized shop can only deal with other union shops. The union leadership, which prefers to stay on the "good side" of the law and the Manufacturer's Association, is mostly white and is generally not interested in organizing the black and Spanish speaking garment workers. We expect that the general strike in the outer wear shops. tentatively planned for next spring, will bring these workers into open conflict with the bosses and union bureaucrats. Local 1101 of the Communication Workers' of America had to reinstate job steward Dave Newman after he took the union to court in July. 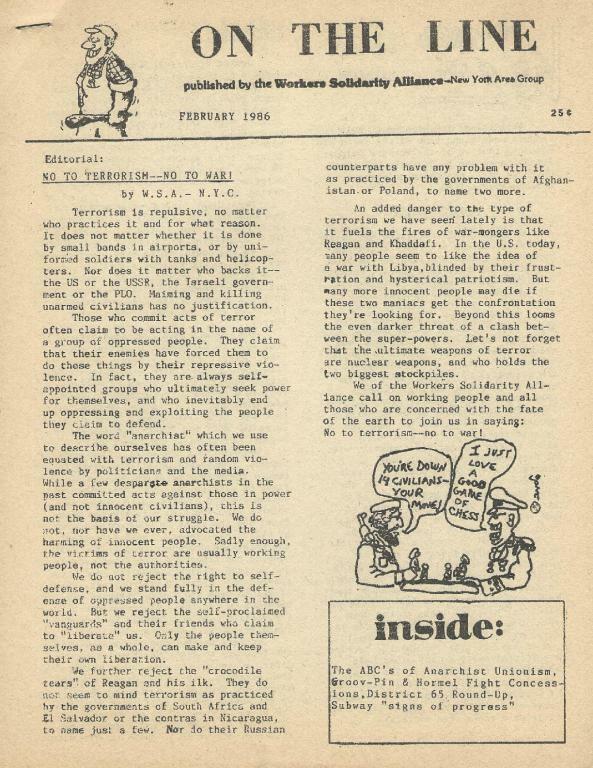 Newman had been removed from his position as steward because he published an article in a workers' paper telling the membership about their rights. The union is appealing the decision. The boss at Sctoco, the Sony repair shop on 39th Street, recently threatened to crack worker's heads because he suspect that one of the workers is ripping the company off. The boss is also an importer from South Africa and so it is possible he learned labor relations there. The people at Sctoco are unorganized and couldn't respond. The technicians are all Spanish speaking while the counterpeople are all American born. The pay is low and the hours are long. The boss does not usually compensate for overtime. Perhaps the Scotco workers can set their differences aside and organize. Rent strikes and actions by tenants for clean and safe buildings are always happening in New York. The landlords just don't care about the tenants. One landlord, Isaac Mawardi, is particularly bad. He;s cut off basic services to the tenants at 107 MacDougal Street and 15 Minetta Street and has threatened them with lawsuits since taking over the building in October of 1976. One tenant even got a bullet through his door. He recently handed the building over to a dummy corporation which is pushing the tenants around. The harassment of the tenants continues as does the rent strike, which is the only way people can defend themselves against the landlords. Similar strikes are going on in the Tremont section of the South Bronx and on East Seventh Street on the Lower East Side. On July 8 a spontanous strike occured at the Republic Steel Company plant in Warran, Ohio and lasted for two days. The wildcat strike, as might be expected, was not sanctioned by the United Steelworkers Union of America, which claims to represent the workers. The USWA, which was organized in the 1930s, had traditionally been a "top down" union and is run by Lloyd McBride, a member of Social Democrats USA. A number of unresolved grievances, most of them over safety issues, led up to the walkout. The strike began when a worker was suspended for refusing to perform an unsafe job. Some 1,500 workers on the four-to-midnight shift joined the wildcat, which had been initiated by the transport workers. The strikers set up picket lines, which were honored by workers on the following four shifts. A court injunction threatening fines and jails sentences forced the workers back into the plant, but not before the company had agreed to expedite arbitration of the suspended worker's case. An explosion in the smokeless powder operation at the Carney Point Plant of the Du Pont Corporation on April 17th killed three workers and seriously injured a fourth. The Occupational Safety and Health Administration cited the company for safety violations and fined it $2,000. Plant Manager E.O. Randolf Jr. said that the corporation would not contest the citation. With this meaningless "enforcement" how can one expect an end to the slaughter going on in U.S. industry? The management of the Agar meat processing plant in Chicago has made several attempts to fire workers at the plant that it claims are not working fast enough. The workers have answered by walking out in support of a female worker employed by the company for 20 years and suddenly accused of not being productive. The workers have done the same for a young Mexican worker also charged with being too slow. Both workers have been reinstated because people stuck together and fought back. The workers are keeping management in line and are setting an example for the rest of us. During the past few months the police Anti-Terrorist Squad have carried out a number of raids that have resulted in the arrests of five English anarchists. These persons have been charged with "conspiracy to cause explosions". The conspiracy charges are part of a recently passed Criminal Law Act which has been used to stop terrorism in England. The police have not yet produced hard evidence to back up the charges against the anarchists. The police found some weedkiller and wiring and are using this to frame the people who have been arrested. The police say that they will also bring armed robbery charges against three of the defendants. The police have also announced that more arrests are on the way. We are members of the Anarchist-Communist Federation and of the International Workers' Association. Third issue of the Libertarian Workers Group's agitational newsletter. The strike against the Bandages By Gauze and Effects company by Local 23-25 of the International Ladies' Garment Workers' Union is still going on. The boss, Mermelstein, has been harassing the union organizers and pickets. He even knocked his own glasses off, picked a scab on his cheek so that it bled and then told the police that a union organizer attacked him. The organizer was busted and booked. The police are on Mermelstein's side and they give out tickets and summonses regularly. They don't protect the union people from Mermelstein and his hired thugs. Perhaps Mermelstein is getting nervous because a new season is beginning and there is a lot of work in the shops. Meanwhile, Sid Gerstein of the ILGWU's Dress Joint Board is coming up for trial. Gerstein is charged with having conspired to bribe an independent union organizer in New Jersey. He comes out of the garment trucking industry which is known for being poorly organized and crime ridden. There have been rumors circulating that ILGWU staff people will have to contribute money for Gerstein's defense whether they want to or not. Such fund raising techniques are illegal but are a regular part of working for the ILGWU. 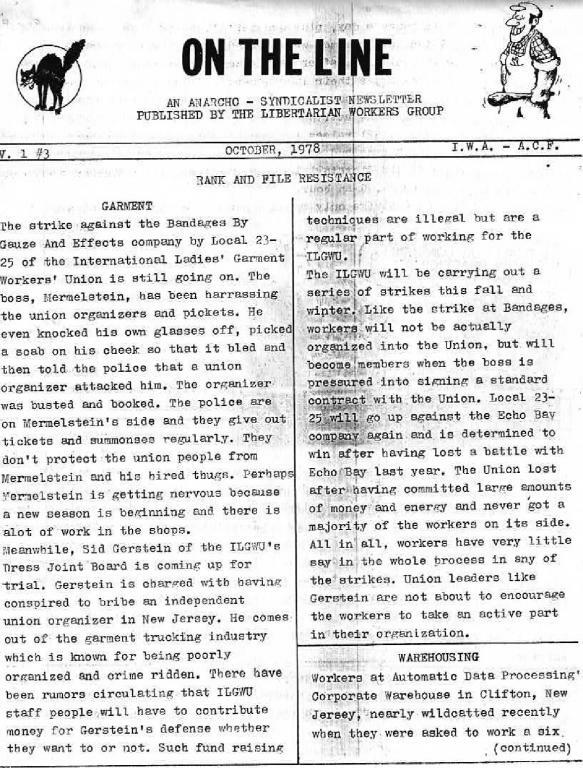 The ILGWU will be carrying out a series of strikes this fall and winter. Like the strike at Bandages, workers will not be actually organized into the Union, but will become members when the boss is pressured into signing a standard contract with the Union. Local 23-25 will go up against the Echo Bay company again and is determined to win after having lost a battle with Echo Bay last year. The Union lost after having committed large amounts of money and energy and never got a majority of the workers on its side. All in all, workers have very little say in the whole process in any of the strikes. Union leaders like Gerstein are not about to encourage the workers to take an active part in their organization. Workers at Automatic Data Processing's Corporate Warehouse in Clifton, New Jersey, nearly wildcatted recently when they were asked to work a six day week, 10 to 13 hours a day, plus occasional Sundays. For weeks leading up to this event the warehousemen were forced to take their breaks nearly one half hour before closing, after having worked under incredible pressure for nearly five hours since their lunch breaks. The lunch breaks are "staggered" because the warehouse is understaffed. Other events leading up to the near wildcat are the attitudes of the boss towards the workers and the company's freeze on all raises for another few months. The boss think that the workers are "pawns and soldiers" who can be worked like mules and then be subjected to his dictatorial whims and wishes. The average warehouse-men at ADP only makes $3.90 an hour. While the threat of a strike only won the workers the right to have an earlier break and delayed the decision about the work hours for the next few months, these warehousemen are, nevertheless, willing to "walk" if they are subjected to a six day (10 to 13 hour workday) week and if the company refuses to grant then decent wage increases. There was a $12,000 rip off at Scotco, the Sony repair center on 39th Street, several weeks ago. The police suspect that it was an inside job so all of the employees had to take a lie detector test. One worker failed the test and was interrogated by the police for several hours. After he was released he was fired, although he was not charged by police.The boss gave him some severance pay and then had payment stopped on the check after the guy left the shop. A new service manager was brought in to boost productivity and two technicians have been fired recently. The workers at Scotco are too divided at this point to organize themselves, but there is a great deal of resistance to the new manager and frequent discussions about the political situation in South America. Clerical workers at Barnard College, members of District 65, went on strike on September 5 after the administration of the college refused to budge on basic wage demands. The clerical workers were supported by the maintenance and security workers, who are members of Transit Workers Union Local 264, who refused to cross the picket line. On September 12, the administration issued a memo to the TWU members which ordered them to return to work or lose their jobs. The maintenance and security workers had been working under a contract extension and a state arbitrator had ruled their strike a violation of the contract. Faced with the college's pressure tactics, the clerical workers returned to work on September 14. Both the TWU and District 65 set a new deadline for negotiations. Both unions will strike on October 15 if both have not settled. In addition, clerical workers at the Teacher's College (also members of District 65) and security workers at Columbia University (who are in TWU Local 241) are also considering joining the October 15 strike agreement. SOLIDARITY PAYS! Recent developments in the newspaper strike lead us to make two basic observations. First, that the 10 separate unions that represent the various trades, by climbing over each other's back, instead of working together more closely, only succeed in weakening themselves and in making their member's gains less secure. Secondly, that the recent concessions made by Murdoch and The Post was due in large part to the militancy of the Pressman. When they succeeded in stopping the Delivery workers from crossing the picket lines during the March-April Newspaper Guild (reporters) strike they created an element of unity which could be important in re-forming the printing unions in New York. Unity and militancy among workers in the printing trades, in our opinion, can only go forward by moving from the many craft unions to a single industry-wide union. This would be a first step to putting the printing trades workers back on their feet and on the offensive. As we reported in our last issue, Dave Newman, a shop steward in the Communication Workers of America, Local 1101, New York City, was removed from his position by that local's leadership after he criticized its position on contracts and its conservative outlook in a rank-and-file paper. After attempting to fight this decision through the usual channels, Dave was still not able to get reinstated by the union bureaucracy. The bureaucrats proclaimed that Dave was part of management and therefore did not have the right to criticize his superiors. Newman then took his case to court. Members of the Industrial Workers of the World (IWW) are involved in a battle in New Mexico. The IWW has organized 150 construction workers and 25 office workers wo work for the Rio Grande Conservancy District, a semi-state agency. Hiring and firing at Rio Grande is based on who you know. Women are subjected to sexual harassment from the bosses. There is a great deal of racial and religious discrimination and many of the workers have been cheated out of pay raises. The workers' response to these conditions has been to set up a branch of the IWW, which is a radical democratic union dating back to 1905. On January 15 of the year, the Scala nightclub in Barcelona, Spain, was destroyed and four workers were killed in a fire supposedly set by molotov cocktails. The police wasted no time in their work and arrested dozens of anarchist-syndicalists. Unable to prove their charges, all of the arrested were released except for seven members of the National Confederation of Labor (CNT). The CNT is a large anarchist-syndicalist union which has lately been protesting the sell-out agreements between the government and other major trade unions. The CNT also has been demonstrating against the government sponsored union elections and has pushed for the rights of the Spanish working class. These demonstrations were the first legal demonstrations by the CNT since the 1930's and the arrest of the CNT members in connection with the fire at the nightclub is an obvious attempt to stop that organization at a time when it can grow and make gains. Anarchist-syndicalists do not believe in terrorism and the CNT maintains its innocence. The libertarians in Spain are continuing to fight for the freedom of their comrades and against the repression. We call ourselves "anarchist-syndicalists" and we have named our group the Libertarian Workers Group. We are a committee of working people who live in the NY metropolitan area. We publish On the Line because we feel that the news and experiences which comes from the many small battles between the bosses and the workers must be shared if the whole class struggle is to advance and if the workers are to someday win. Basically, we believe that the capitalist class is unnecessary and that government (by which we mean the political state and all of its bureaus) is inherently oppressive. The state and the capitalist class, while not seeing eye-to-eye on everything, are built on exploitation. The capitalists do not produce wealth or render services unless they are forced to. They extend and keep their power because they are able to call the shots in industry and government and because they steal, in a very sophisticated way, what the working person produces. By so "stealing" from the real producers - the workers - and then by selling to consumers - most of whom are also workers - the capitalist is able to male profits and keep power. Landlords and the utility companies steal from workers in a similar way. The government insures that business goes on as usual and even runs some industries. The decisions on what will be produced, how much will be charged as prices and how goods and services will be distributed are made in a "top-down" way in urban and political centers bu bureaucrats and capitalists. People are taught to play a passive role in society: to take uninteresting and low-paying jobs, to vote for candidates that really have nothing to offer, to experience life through television and movies and to accept racial and sexual oppression as normal. Meanwhile, thousands of people are going to jail, becoming addicts or committing suicide. It is not enough, we think, to try to reform society. The boss-workers relationship, protected as it is by all of the governments and churches the world over, must be done away with. The capitalist system, in which one person works for another and the lives only to work in the framework, is full of contradictions and shortcomings. The decision on what will be produced and distributed, on how housing and community problems will be solved and on how natural resources will be allocated must be made by the working class on a local level through democratic organizations controlled by the rank-and-file. Education must be available to all and must be combined with technical skills useful in the modern world. Racial and sexual barriers must be abolished. In short, the working class must emancipate itself. We think it can only do so by building democratic organizations in which all workers can participate and from which all workers will benefit. The center of these organizations must be the workplace and the community. The tactics we think are most useful - are the social and general strike - mass civil disobiendience by working people - for rank-and-file control and for neccessary immediate gains. Revolutionary unions must be created to fight for decentralized economic planning and real industrial democracy. Anarchist-syndicalism is the sum total of these objectives and offers the means by which to obtain them. Fifth issue of the Libertarian Workers Group's agitational newsletter. The Vol. 2, No. 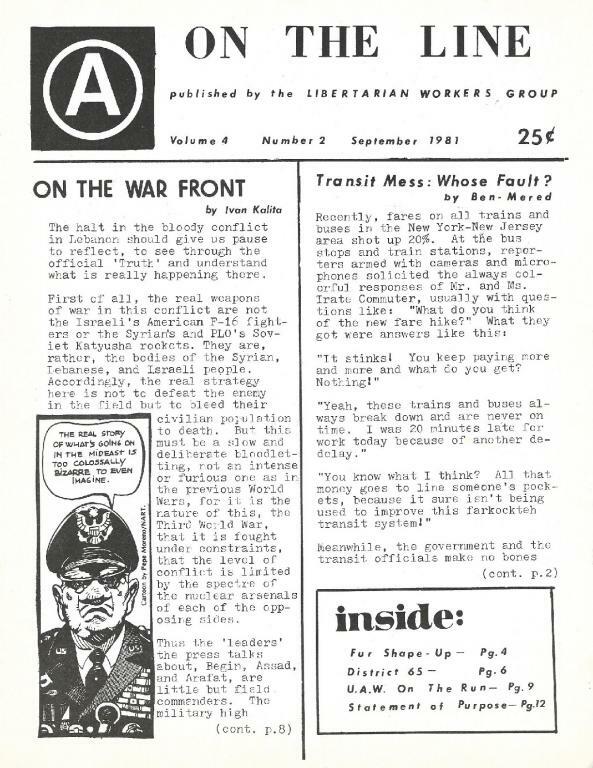 4 (November-December 1979) issue of On The Line, the monthly newsletter of the New York based Libertarian Workers Group. The Vol. 3, No. 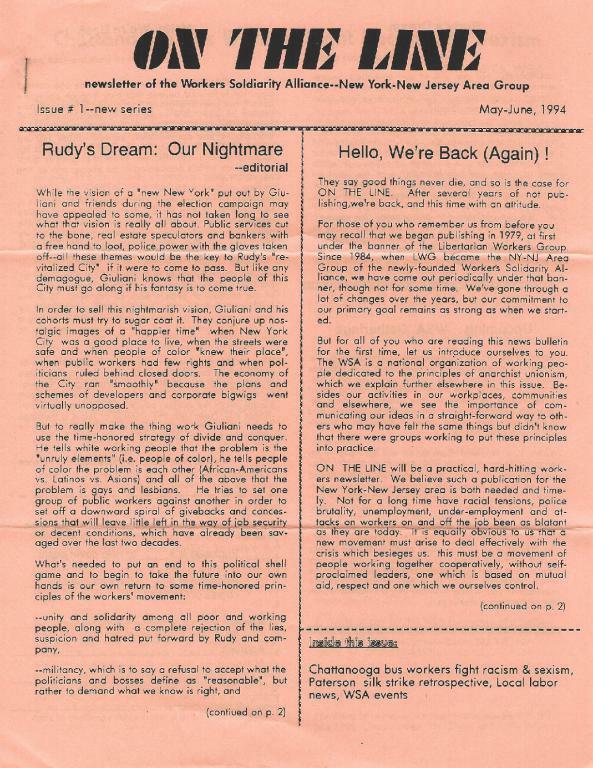 2 (May-June 1980) issue of On the Line, the monthly newsletter of the New York based Libertarian Workers Group. The Vol. 4, No. 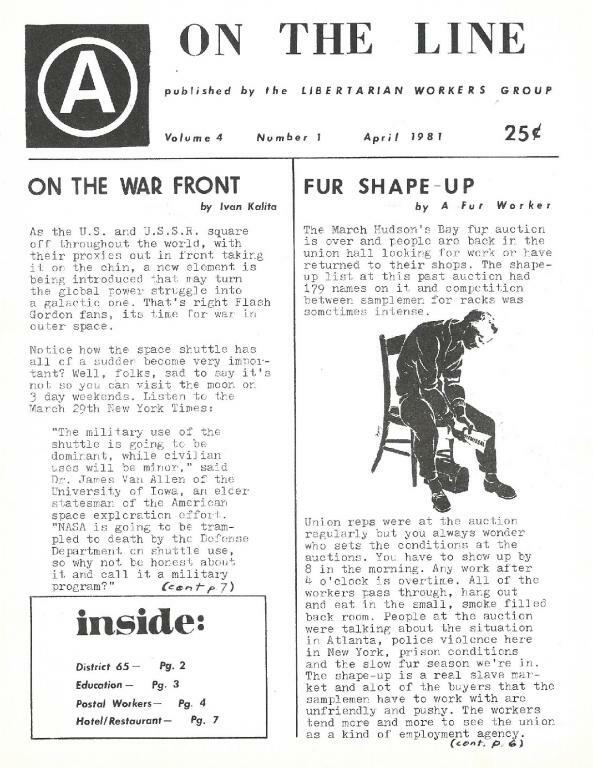 1 (April 1981) issue of On the Line, a newsletter of the New York based Libertarian Workers Group. - Special: Needle Trades Supplement for "On The Line"
The Vol. 4, No. 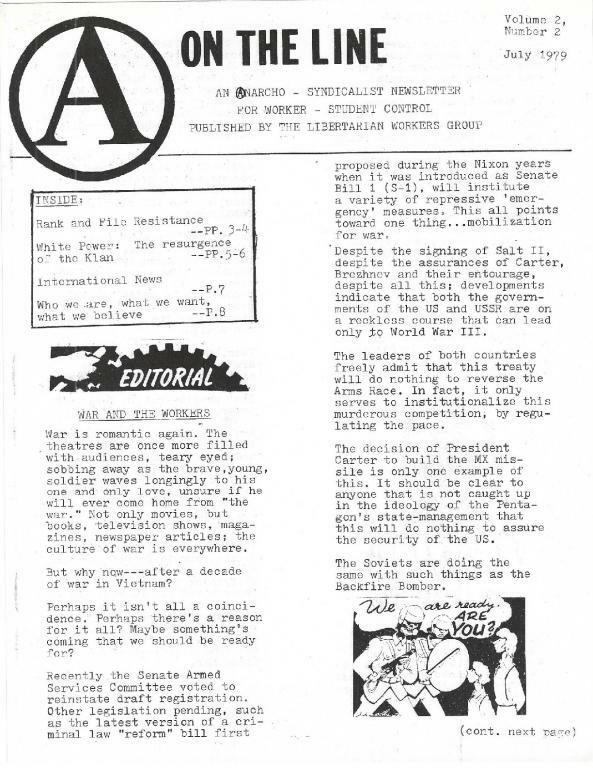 2 (September 1981) issue of On the Line, a newsletter of the New York based Libertarian Workers Group. - Transit Mess: Whose Fault? - Hello There .... We're Back! The No. 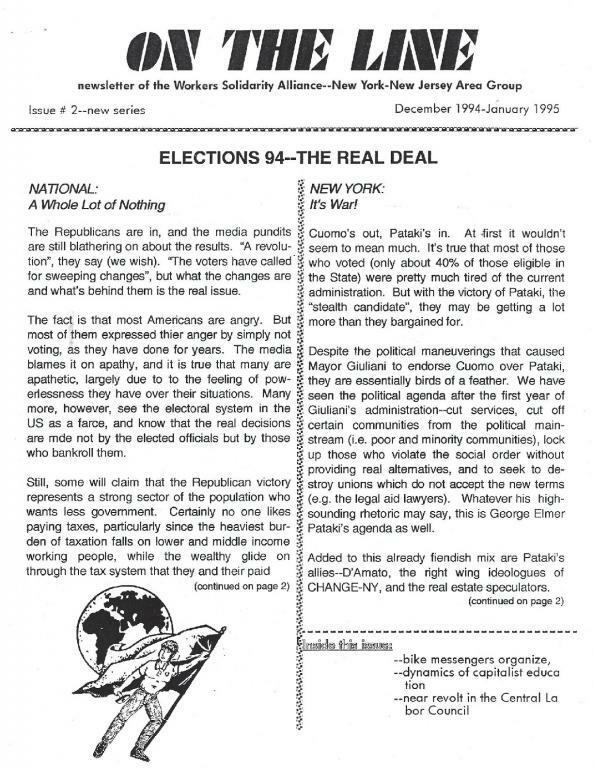 1 (May-June 1994) issue of On the Line, a newsletter of Workers Solidarity Alliance in the New York/New Jersey area.